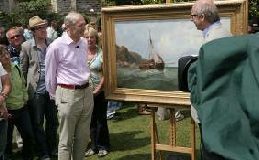 In the autumn the BBC confirmed that we would be a location for The Antiques Road Show in July. We were stunned and thrilled but it soon dawned on us that this was a precious jewel in the BBC’s crown with which we had been entrusted and that there was an enormous task ahead to make sure everything went to plan. Most of the venues they choose are houses, museums etc with full time administrative and catering staff; here it is just us! In May we had a planning meeting around the Dining Room table with the BBC Production team, the two local policemen and us; they were amazed that it was just Hugh, myself and Nancy Johns (who voluntarily ran the Tea Room for the church) who were going to be organising such a huge event. I am sure that they must have had their doubts at that stage whether it was going to work here! The logistics were enormous; we were to expect between 500 (if wet) – 2,500 people, many of whom would need food and drink, but we would never know until the day! The car parking, the promotion (thousands of flyers, posters, three huge banners, the local press and any other way we could think of), local accommodation for the BBC (approx 90 beds), crime prevention, vehicle access for the huge technical vehicles, loos, masses of extra tables, chairs, crockery to be hired and so much more! Leighton had to virtually rebuild the bridge between the Upper Lawns and the road as it was collapsing and unsafe for so many cars! We needed 31 voluntary stewards to man the queues to each expert’s table. Every bedroom in the Abbey was booked for Fiona Bruce and the experts; 70 of the production team and experts wanted dinner the evening before and everyone from the BBC, stewards etc (130) needed lunch in the Dining Room on the day! Some of the voluntary stewards were to provide tea, coffee and biscuits all day to the experts and those waiting to be filmed. There was a huge amount to organise with many, many sleepless nights to follow. The BBC marquee was put up on the front lawn as an insurance against wet weather. From then on it was non-stop with everything arriving in huge articulated lorries. The marquee, the tables, chairs and umbrellas travel to every venue so have quite a history themselves. It was exciting and that was the moment we really began to enjoy ourselves after the months of hard work. 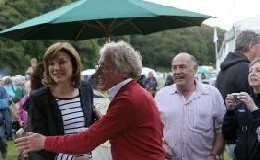 On 6th July Fiona Bruce arrived to start filming the introduction to the show. She was such a charming person as was everyone from the BBC. In the afternoon we had a briefing for the volunteer stewards from Tiggi Trethowan, the Event Manager. She made everyone feel so proud to be involved. 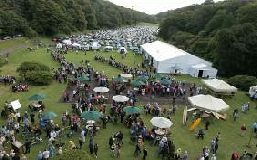 Stewarding for the Antiques Roadshow is a vital job, you are there to keep everyone happy after queuing so long and to keep ‘your’ expert happy too making sure of people arriving at the table with their treasures unwrapped. The stewards really make or break a show and ours were voted by the BBC as the best this year! The experts staying in the house arrived; Fiona Bruce, Paul Atterbury, Philip Mould, Hugh’s cousin Mark Poltimore, Hilary Kay, Susan Rumfitt, Richard Price, Janet Gleeson, Clive Stewart-Lockhart and Barley Roscoe. In the evening we had a lovely party here with all the experts and the production team, all staying locally. It was a wonderful atmosphere starting with drinks and going on to dinner in the Dining Room and the Billiard Room, where we had extra tables. We woke on 7th July at 5am to a terrific storm raging outside and pouring rain; I just couldn’t believe that this was what we had earned after so much hard work! However, ‘rain before seven, sun before eleven’ really worked for us; apparently as near as Clovelly it rained all day! From daybreak cars started to arrive and by the end of the day we had had over 3,000 people, surpassing all expectations. The house was closed to the public for the day as the Drawing Room was the Make-up Department, the Billiard Room was the Waiting Room for those waiting to be filmed and the Dining Room was the canteen with lunch being served nearly all day for 130 of the experts, crew and stewards. Jenny Stone and her son Sam, who help us with functions, did all the catering admirably from our minute kitchen, helped by a great team of Carol and local helpers. It was such a fantastic day; lots of people had come and many new treasures found. There was a wonderful atmosphere, it was a day we will never forget. After all the hard work from everyone, over 3,000 people had come here and it had been a dry day. Working with everyone at the BBC had been a joy, they had shown so much kindness and help to us all.